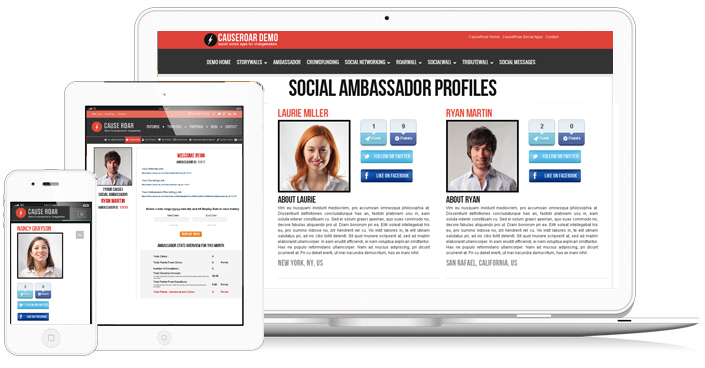 CauseRoar Social Ambassador App turns Supporters into Ambassadors for your cause. CauseRoar Ambassador dashboard gives your ambassadors all the tools they need to manage their outreach to family and friends and view the outcome of their efforts. Social media is completely transforming our ability to create change. It’s now possible to harness the power of social media and educate people worldwide. It’s simple — as individuals, our ability to impact people globally is limited; together it’s extremely powerful. CauseRoar’s Social Ambassador App gives your organization the tools to bring your supporter’s voices together under a common theme and set of messages empowering them to spread the word online about your organization. Not only does this help to amplify your message across all social networks, but it also gives your supporters a feeling of being an active participant in your organization. The Social Ambassador App turns Influencers, Supporters, Employees, Customers and Advocates into Ambassadors for your cause. Leveraging the collective power of their influence across their personal social networks creates social change and empowers others to do so. When your message is coming from a trusted party ("influencer"), that message can help spark valuable word-of-mouth campaigns that increase brand visibility and ultimately drive action.